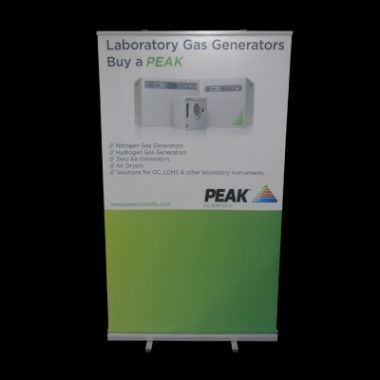 GJ Plastics / Banner Displays / Roller Banners. 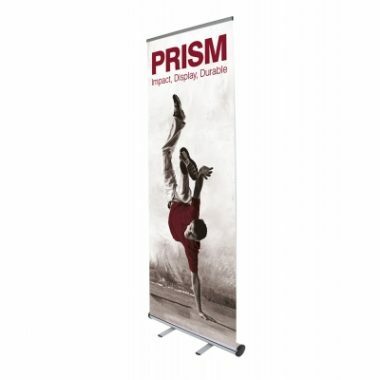 Event promotion using Roller Banners. They are easy to assemble and transport and a lightweight carry case is provide for you. GJ Plastics Ltd aim to provide you with quality products printed in our own facility by our highly trained print team. Send us to print ready artwork (template PDF is available on request). For an additional charge, if you want us to design your graphic for you talk to one of our designers. 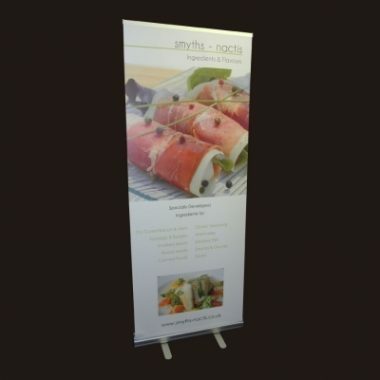 Roller Banners have quickly become a popular promotional display choice the cost effective price. 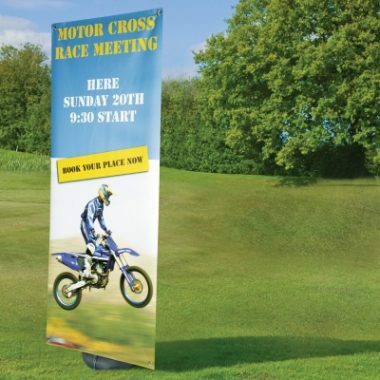 Portability, versatility and speed of assembly, have all contributed to the increased uptake of roller banners in the exhibition, events and promotional markets. 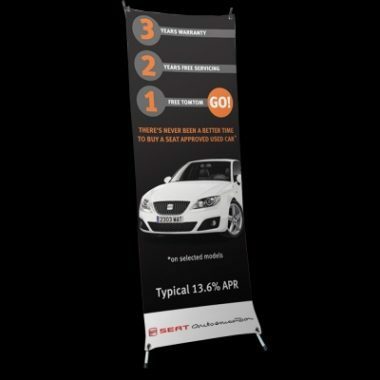 Our range of roller banners provide you with a variety of types and sizes, from the desktop, floor standing offerings for internal and external use. It is important to note that customers should read our print ready artwork requirements. Please understand that by purchasing or placing any order for printed products that this constitutes agreement to abide by them. 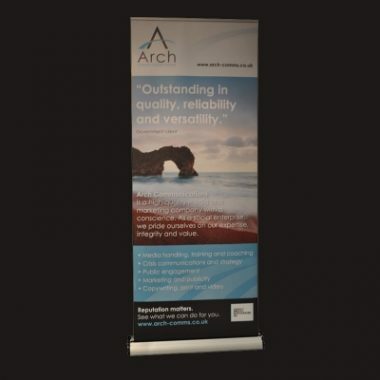 If you have any questions about the roller banner stands or need advice on the graphics. Graphics are protected by base in transport. Comes with a guarantee on the hardware. Delivery within 3-6 working days of receiving order and approved artwork. 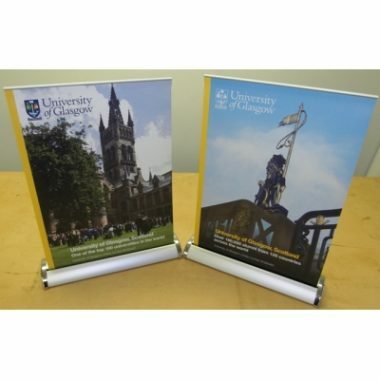 If you are designing the roller banner yourself here are a few suggestion that may help. Use a large font and images so it can be seen from a reasonable distance. Contrasting your background and text colours is always a great idea and focusing on one main message to get your point across quickly. 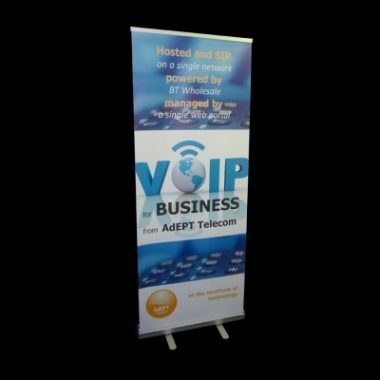 Ideal Uses for Roller Banners, Exhibitions, Trade Events, Retail promotions, Restaurants, Networking or seminars.